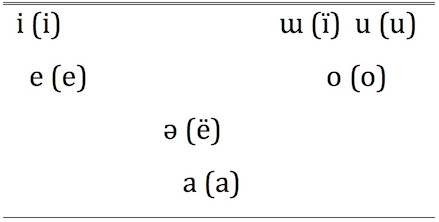 TRS has seven oral vowels [i e ə a o ɯ u] as illustrated in Figure 3 below. Conventional orthographic symbols are included in parentheses. Of the vowels listed here, the mid central vowel /ə/ rarely occurs and was found in only four tokens we have documented thus far, the interjection ë [əː43] ‘what?’, ë’ëj yiô’ [əʔə32h ʒioʔ4] ‘hiccough’, hiëj [jə3h] ‘stone’ and finally, gudurë’ [ɡu–durə3ʔ] ‘PST–destroy’ that appears in the text below. Younger Triqui-Spanish bilingual speakers in San Andrés Chicahuaxtla tend to merge /ə/ with /e/ and /ɯ/ with /i/ which may point to a future loss of both /ə/ and /ɯ/. In Santo Domingo del Estado, a town adjacent to San Andrés Chicahuaxtla, both /ə/ and /ɯ/ have already merged with /e/ and /i/, respectively. TRS has four nasal vowels: [ĩ ã ɯ̃ ũ]. [ẽ õ] are not lexically derived but may occur in morphologically-derived forms in verbs, possessed nouns, predicate adjectives and prepositions (Elliott et al. 2016; Hernández Mendoza 2013). Final vowel nasalization in these forms serves as a marker for 3sg forms, for example, [siː32–nat̪õː2-õ3] POSS–banana-CLS–RDUP:NAS:T3 ‘his/her banana’ from the unpossessed noun [nat̪oː2] ‘banana’ and [d̪u4ʔwe2-h-ẽ3] sell–CLS–RDUP:NAS:T3 ‘he/she sells’ from the root [d̪u4ʔwe2-h] ‘sell’.